Before Paul Estève and Chrystelle Varielle decided to create their own domaine in 2003, they were working for various, un famous producers within the Rhône valley that sold their grapes to the co-ops and where living seasonal workers free-spirit life. We’re so happy that they decided to get a little more settled in one place and do their own things (still being hippies though). Although they use all their 3,5 hectares, it’s not nearly enough to cover the demand for these admirable wines. 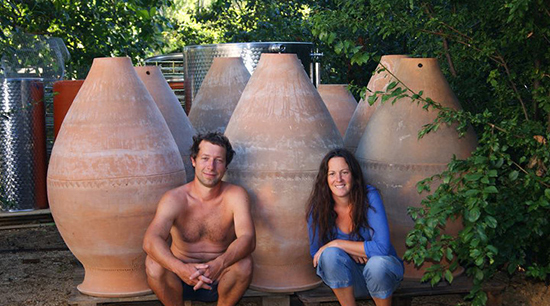 Their farm is situated in the small village of Cheminas in the south of St Joseph, on a plateau close to Tournon. Apart from making wines, they also have a small farm with some pigs, doves, hens and fruits. They also make their own charcuterie which some lucky people get to try and Paul makes good beer for themselves and their friends. They also work on opening a wine bar in the next-door village Secheras, where they bought a new cellar for their red wines in 2017, which had a suitable bar-house that came with it. 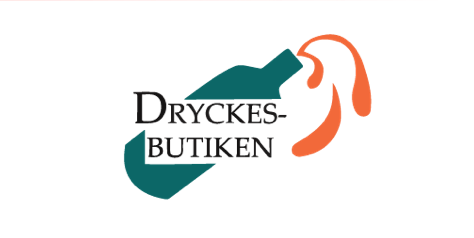 They have been experimenting with making Syrah on amphora for quite a while and with such a great success that almost all their wines are made in amphora since 2011. 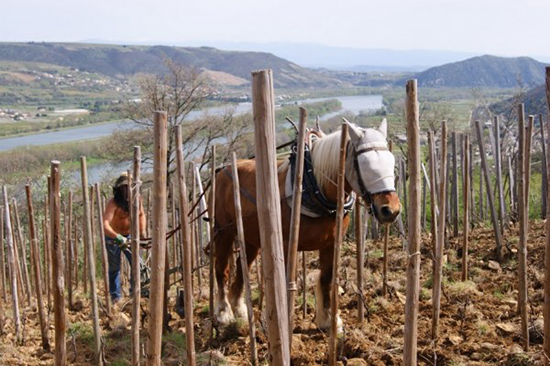 They’re working their vineyards mainly with horse and have been working organic since start, and as natural as possible in both vineyards and winery since 2008. Paul started to plant the Madloba vineyard 14 years ago and choose an old clone of Syrah, selection massale. This steep terraced vineyard has a much stronger wind then their other St Joseph vineyard on the top and the wines really ends up differently. 13 years ago they also planted 0,5 hectares of Syrah in Ardeche, just above the village of Arlebosc, first vintage made is 2015. Last planting has been with various Georgian varieties just around their house, we are curious to see the results in the future. The wines are true, pure, elegant and a very fine expression of Syrah! Soil: Granit, mica schists and gneiss, 350-meters altitude, east exposition on the highest part of Saint Joseph. Vinification: Direct press followed by fermentation and aged on the lees in amphora before bottling in end of March 2017. Soil: Granit, mica schists and sand, 400-meters altitude, on the plateau above Arlebosc in Ardeche. Age of Vines: 12 years old. Vinification: Destemmed then fermented for 3 weeks in amphora. Gently pressed and aged 6 months in stainless steel tanks before bottling. Age of Vines: 50-60 years old. Vinification: Destemmed and fermented for 3 weeks on amphora, then gently pressed and aged 12 months in stainless steel tanks before bottling. Soil: Granit and mica schists, 250 meters altitude, steep, terraced vineyard with west exposition facing Crozes-Hermitage. Vinification: Fermentation for 6 months on amphora, then gently pressed and aged 6 months in amphora before bottling. 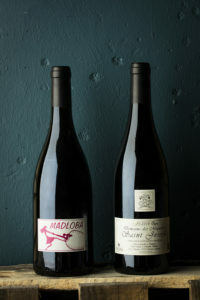 Extra: why Cuvée Madloba? Madloba means thank you in Georgian. Paul was having the time of his life first time visiting John Wurdeman, Pheasants Tears in Georgia. The last day of his stay there, a big party was thrown at Johns place. Of course good times with a lot of eating, drinking and singing was involved. So when the coaches arrived in early morning to take them to the airport Paul didn’t want to leave all fun. He found the best solution to climb in to a qvevri and refused to get out. After a couple of hours there, when he was sure the flight was long gone he eventually crawled out.. Both Chrystelle and Paul really loves Georgia, and goes there frequently, but it’s seems like Paul handles the returns home better these days.